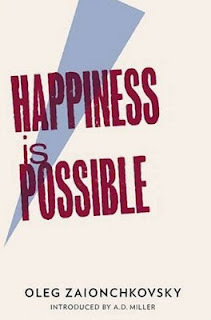 Zaionchkovsky’s book Happiness is Possible may sound like a self-help book but you would be wrong. Here is Zaionchkovsky’s love letter to the biggest love of his life - Moscow. Happiness is Possible is a series of interlinked short stories revolving around the life of an unnamed writer, living in his beloved Moscow as he searches for contentment within his own life and those around him. Zaionchkovsky has the reader questioning reality throughout the book. Firstly, there is the mystery around the author. Both the narrator and Zaionchkovsky have similar lives – first working in Engineering and then writing, both grew up outside Moscow and then finally moved to the capital. Is this an autobiography pretending to be fiction or is it fiction? Secondly, The narrator turns the lives of his neighbours, his ex-wife and her partner into a soap opera. I wasn’t quite sure if the stories were real observations from the narrator or if they were made up, as he has tried to create happiness for them. Lonely neighbours fall in love; warring families find peace and restoring love to those who have lost it. The main antagonist to finding happiness is Moscow. The pursuit for a Moscow residence permit and apartment dictates where people live, their work and the people they share their life with and for how long. The city is a bigger motivation rather than happiness, which in some cases is sacrificed. The reader sees this in the narrator’s relationship with this ex-wife and her need to climb the social ladder. The devotion to the city means characters have to forfeit a portion of their happiness and Zaionchkovsky shows the reader the loneliness and isolation from living in a city. The reader also sees the narrator fights to find his own happiness within his life and also with his writing. He struggles to fit in with the modern Russia especially when asked by a company to write a book about a fashionable restaurant. He fails to understand that literature has now become a product. “Noticing that they had all come to the meeting with folders, I felt guilty because I hadn't brought anything apart from my indigestion tablets." There is a definite influence from Woody Allen within Happiness is Possible. The combination of philosophical reflection and comedy make it an insightful but also enjoyable read. Zaionchkovsky’s dark sense of humour will appeal to readers who like black comedies and are prepared to follow this slow burning story. Zaionchkovsky pays homage to the struggles and hopes that ordinary people face in their lives. Happiness is Possible is the sort of book you could read from beginning to end and you would be rewarded with the overall story or you could dip in and out, reading the stories individually, more slowly.